Z-Man Lures recently introduced their new Texas Rig jigheads, designed to give anglers that extra advantage with a weedless design, but included into a jighead. 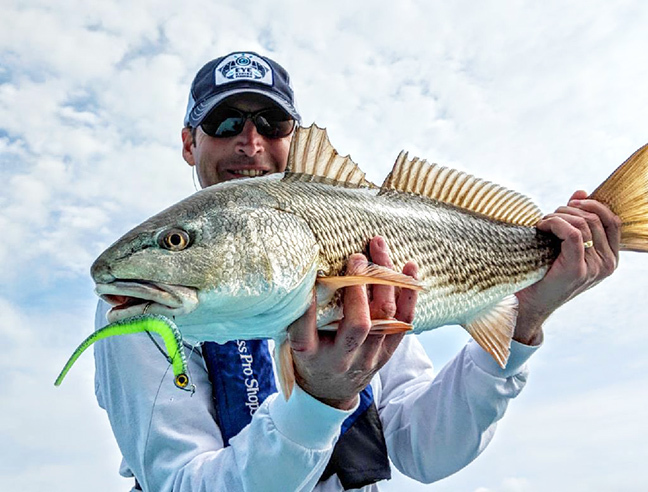 LADSON, SC – The possibilities make casting arms twitch with confidence: a snag-shedding jighead with built-in articulation and action. Z-Man Fishing, known for its patented ChatterBait® bladed jigs and next-generation ElaZtech softbaits, has in recent years also become a go-to source for smart, versatile jigheads. 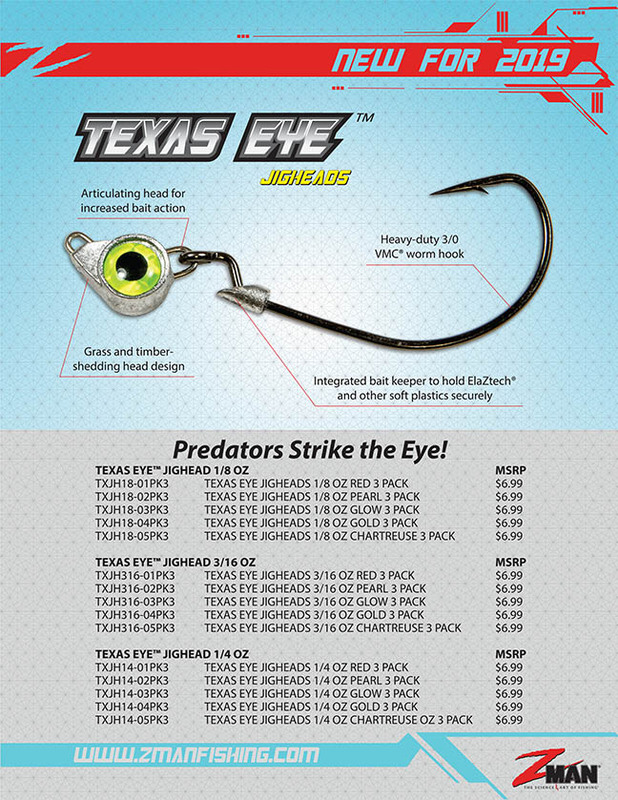 The new Texas Eye Jighead might be the progressive tackle company’s most innovative design to date. Melding a weedless Texas rig with a free-pivoting jighead, the Texas Eye gives anglers an unbeatable one-two punch. 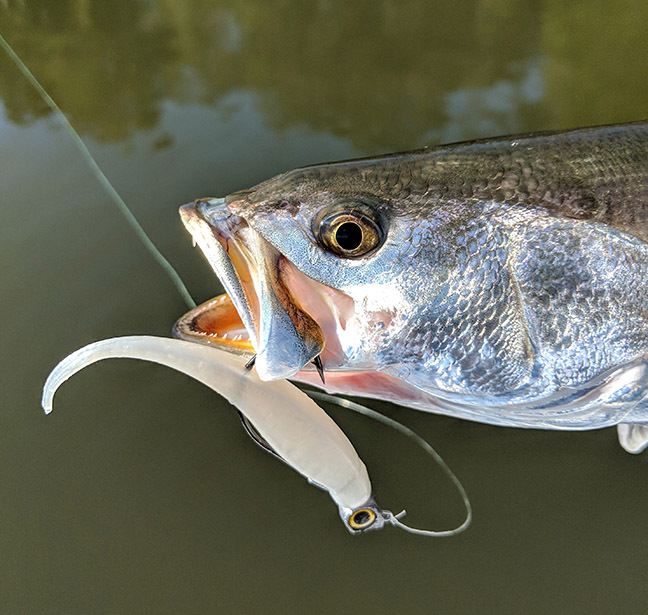 Fladd, an optical engineer, acknowledges that the design goal of the Texas Eye was to build a fresh- and saltwater jig that married the snag-immunity of a Texas rig with the frenetic movements of a free-swinging jighead. Phillips, a pioneering saltwater angler and one of the early inshore guides in the Charleston, South Carolina area, built his original jigs to maximize what he calls the “eye factor.” “I learned years ago while fishing offshore that the most productive lures, by far, were those sporting large accentuated eyes,” observed Phillips. “Predator fish of all kinds key on the eyes of their prey like no other anatomical feature. From there, the team fleshed out the other critical details: an up-angled eyelet for heads-up bait posture during the retrieve; a flat-sided, planing head for stability and a spoon-like swimming motion; a tapered, streamlined angle to the eyelet for natural grass deflection. Rather than affixed permanently to the hook, the Texas Eye Jighead connects loosely to a free-swinging 3/0 VMC® hook for maximum movement of the trailing bait. 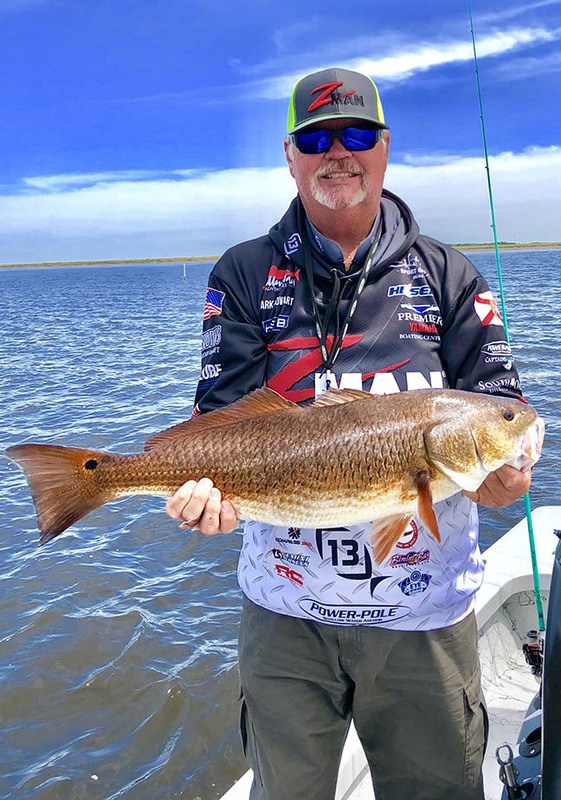 “Unlike other swing-heads,” says Fladd, “our line-tie is positioned above the centerline, presenting the jig’s oversized eyes horizontally and swimming the soft plastic trailer in a natural, heads-up position. At rest on bottom, buoyant ElaZtech baits rise, tail up—a totally natural posture. 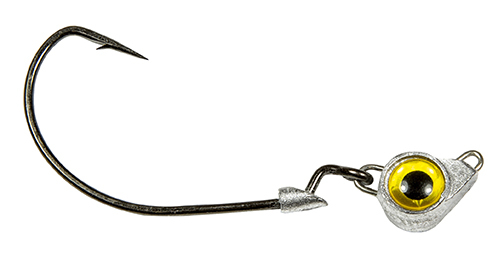 Molded to the hook, a streamlined “hangnail” bait-keeper pins ElaZtech and other softbaits to the base of the jighead. Fladd and Cowart built it to make rigging quick and easy. Moreover, the black nickel hook is sized to match most Z-Man ElaZtech profiles. Fladd suggests marrying the Texas Eye Jighead with a Swimmin’ Trout Trick, Trout Trick Jerk ShrimpZ, DieZel MinnowZ, 3” MinnowZ or 4” Scented Jerk ShadZ. Matching a wide variety of ElaZtech and other traditional softbaits, new Z-Man Texas Eye Jigheads are available in 1/8-, 3/16- and ¼-ounce weights and five eye-catching colors. For more information visit www.zmanfishing.com.